Patience, It takes awhile to load the artwork. Farmer Steve works with his tractor every day. The tractor's name is Little-T. The farmer calls him Lil-T.
Today, the farmer is plowing the field. Lil-T is working very hard. All day long, Lil-T goes putt-putt-putt-putt. Lil-T pulls the plow through some clay. He pulls hard, but the clay is holding him back. He pulls harder. Black smoke comes out of his muffler. His motor goes puttt---puttt---puttt---hissss, puttt---puttt---puttt-hisss. Then it happens, puttt----puttt---POW! Lil-T blows his head gasket. His motor stops. He can't work anymore. Farmer Steve tries to fix Lil-T, but he can't. Lil-T is sad, and cries. The farmer does not have time to fix Lil-T. He parks Lil-T next to the barn. Farmer Steve goes shopping for another tractor. Farmer Steve goes into town to the farm dealer. 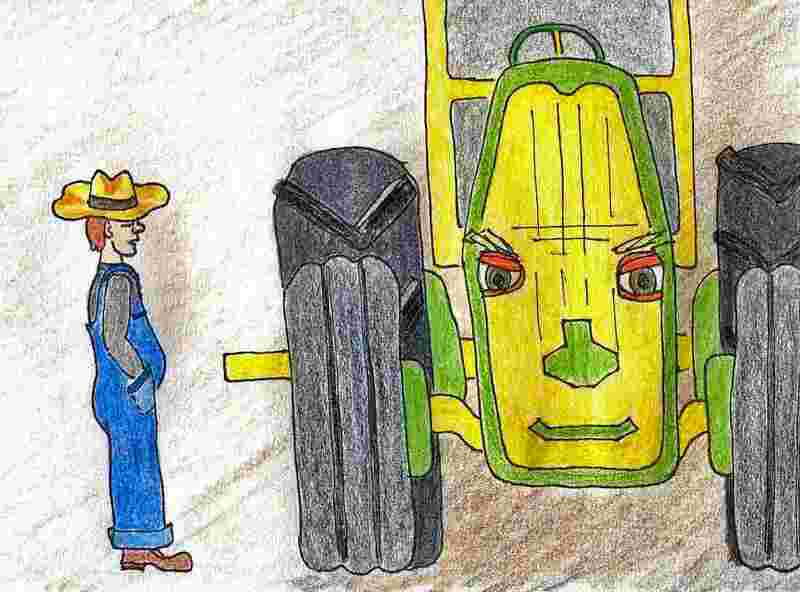 He looks at a green and yellow tractor. He says, "I can plow fast with a tractor like this." Big-T is big and won't fit in the barn. Farmer Steve parks him in front of the barn. Lil-T is around the corner. He can't see Big-T.
Lil-T is lonely. He wants to tell Big-T about the farm. Morty Angel visits the farm. Morty hears Lil-T crying next to the barn. "Why are you crying," asks Morty? Steve doesn't have time to fix me." "I can fix your gasket," said Morty. "I will ask my angel friend Ben to help me." "Great," says Lil-T, "I will go back to work." Angel Ben helps Morty fix Lil-T's head gasket. Lil-T stops crying and smiles again. He is happy. He will go back to work. "Thank you Angel Ben, thank you Morty." Morty pushes Lil-T with Skye Scooter. Lil T's motor starts, and puffs out hearts of smoke. He is very happy. Morty and Angel Ben take Lil-T for a test ride. They ride around the farm. Lil-T is strong again. "Let's go find Farmer Steve and Big-T,' shouts Lil-T.
"Okay," says Morty, "I'll race you." Farmer Steve is plowing with Big-T. Big-T's motor sounds strong. He makes a steady roarrrr-mmmm-grrrr-mmmm noise. "Wow," says Lil-T, "He can plow four times more than me." "Don't worry Lil-T," says Angel Ben, "Farmer Steve will find a new job for you." "I will help him," said Morty. 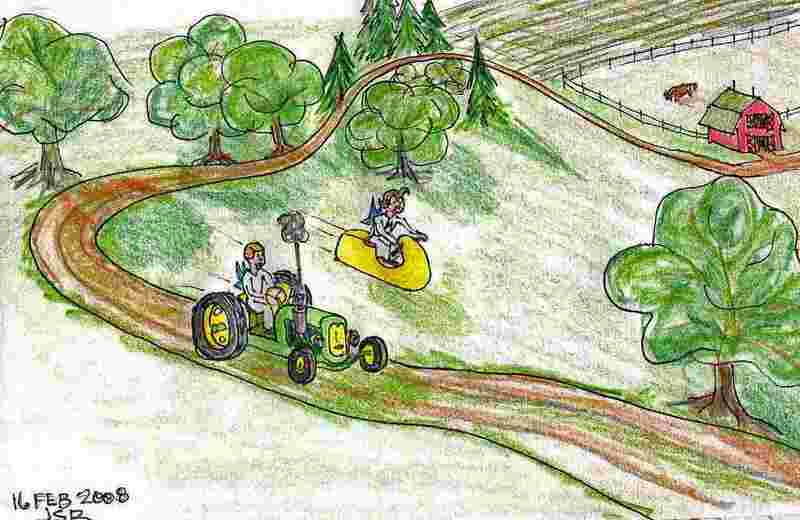 Morty and Angel Ben take Lil-T to the school next to the farm. "Lil-T will mow all this grass." "Great idea," says Angel Ben. "WOW," said Lil-T. "Will Farmer Steve let me work here?" "I will ask him," said Morty. Morty tells Farmer Steve to let Lil-T mow the lawn at the school. Lil-T listens to the farmer tell Morty that he will let Lil-T go to work at the school. than I can," he says. "I love to work all day." they did. Lil-T is very happy that he is working. He is also happy because Big-T is his friend. Angel Ben and Morty Angel are also his friends. "I never thought blowing my gasket could turn into such a good thing," said Lil-T.